Today we continue our Presidential Geography series, a one-by-one examination of the economic and demographic peculiarities that drive the politics in all 50 states and the District of Columbia. Today’s stop: West Virginia, the Mountain state. FiveThirtyEight spoke with Robert Rupp, a professor of history at West Virginia Wesleyan College, and L. Christopher Plein, an associate professor of public administration at West Virginia University. Barring a truly shocking turn of events, Mitt Romney will win West Virginia’s five electoral votes. The state is rural, culturally conservative and religious. Of the 50 states, West Virginia has the fifth highest share of gun owners, the third oldest median age and one of the least diverse and least educated populations — all variables associated with Republican Party affiliation. After decades of Democratic dominance, West Virginia voted for the Republican candidate in the last three presidential elections. 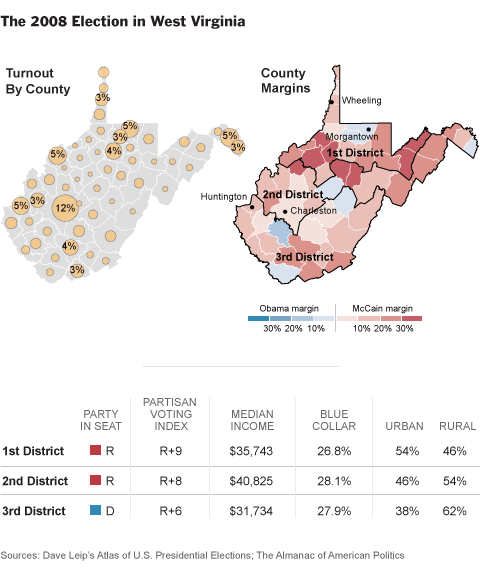 Just like Georgia, the last state profiled in this series, West Virginia has gone from solid blue to solid red on presidential electoral maps. But unlike Georgia, West Virginia still elects Democrats in statewide races. Both of West Virginia’s senators are Democrats, as is the state’s governor. Democrats claims large majorities in the State Senate and the West Virginia House of Delegates. And Democrats still maintain almost a 2-1 registration edge over Republicans in the state. How have Democrats maintained support in such a conservative state? And does the party’s remaining strength signal that West Virginia might once again become competitive in presidential campaigns? Part of the answer to the first question is lingering loyalty. “You can always find someone at a rally who will say, ‘I would vote Republican, but my dad would kill me,’” Mr. Rupp said. The more fundamental answer, however, is that Democratic candidates in West Virginia often bear little resemblance to national Democrats. State Democrats tend to be more conservative on a range of issues. Moreover, they emphasize their independence from the national party. Just recently, Gov. Earl Ray Tomblin, Sen. Joe Manchin and Rep. Nick Rahall, all announced that they would not attend the Democratic National Convention in Charlotte. The greatest sources of conflict between national and West Virginia Democrats are energy and environmental policies. Coal was the lifeblood of the state’s economy for decades, and — despite receding as an employer in the state — is still an integral part of the West Virginia psyche (the state’s flag features a farmer and coal miner). A pro-coal stance in West Virginia is as vital a component in electability as being from West Virginia. It was Al Gore’s perceived hostility to coal and mountaintop mining that helped George W. Bush carry the state in 2000, after it had voted Democratic in 14 of the 17 presidential elections since the Great Depression, when West Virginia began electing Democrats in earnest. Since the 2000 election, as national Democrats have pursued policies to lower greenhouse gas emissions, West Virginia Democrats have had to work even harder to show their pro-coal bonafides. Mr. Manchin, for example, actually shot the 2007 cap-and-trade bill in a campaign commercial (as governor, he also sued the Environmental Protection Agency over limits on mountaintop mining). But King Coal’s power in the state may not last indefinitely. In 1948, 126,000 West Virginians worked in coalmines. In 2011, that number was 22,336. As easily accessible coal seams have been depleted, the so-called “coal counties” in southern West Virginia have lost population. At the same time, less coal-centric areas of the state – the Washington D.C. exurbs in the eastern panhandle and the communities around Morgantown, where West Virginia University is located – have gained population, Mr. Plein said. 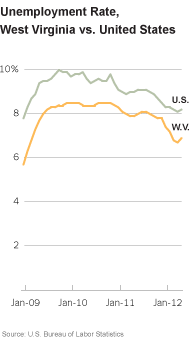 The coal industry has also been hurt by a boom in cheap natural gas in the Marcellus Shale. About 2,000 coal mining jobs have been shed in just the last few months. Many West Virginians are looking to other industries, such as tourism, to replace resource extraction as the state’s economic backbone. Wal-Mart is currently the biggest employer in the state. Still, the coal industry remains politically potent. Late last month, when West Virginia Senator Jay Rockefeller gave a floor speech in favor of an Obama administration rule that the coal industry opposes, it was interpreted as proof that Mr. Rockefeller was planning to retire. On Nov. 6, Election Day, those who are particularly impatient for West Virginia election results can look to Marshall County for clues. Part of West Virginia’s northern panhandle, Marshall County — like much of north West Virginia – is culturally and economically part of the Pittsburgh area. In the last three elections, Marshall voters have been a virtually perfect barometer of the statewide vote, matching it exactly in 2008 when both the state and county voted 53 percent to 43 percent for Senator John McCain. The FiveThirtyEight model currently gives Mr. Obama just a 5 percent chance of winning in West Virginia. Mr. Romney is projected to expand on Senator John McCain’s 2008 margin of victory. Compounding the issue-specific rightward pull on state Democrats, there is also an absence of a leftward pull. While a state like Georgia has large urban and minority communities, which tend to elect fairly liberal Democrats, West Virginia is 94 percent white and rural. There just aren’t that many liberal or progressive voters in West Virginia. 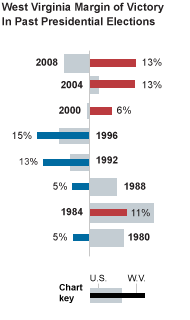 In 2008, 48 percent of voters were Democrats, but just 18 percent of voters described themselves as liberal, according to exit polls. The diminishing impact of coal as a political force in the state may be a hopeful sign for Democrats. But as long as there are major issues — like energy — where the positions of the national Democratic Party (and thus Democratic presidential candidates) are anathema in West Virginia, it is likely Republicans will continue to win the state in presidential elections. The more immediate question is: will state-level races, where Democrats still dominate, begin to shift and match the state’s Republican preference in presidential elections?